Those who can, do, those who can't, criticize. A riveting sermon by Fr. Vazken about moving from excuses to living. When your cross becomes an excuse to live, it's time for a reassessment of life. A new understanding of the Cross. 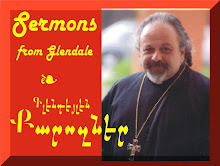 Sermon delivered and recorded LIVE at the St. Peter Armenian Church Youth Ministries Center, Glendale on Sunday, May 18, 2014 - Apparition of the Holy Cross. Mothers' Day Sermon delivered by Fr. Vazken Movsesian on May 11, 2014. A look at Jesus and his relationship with his mother and his mother with him. Topics: motherhood, life and the need to work together. Jesus & Mary - Mary & Jesus. Recorded LIVE at the St. Peter Armenian Church and Youth Ministries Center.